Anyone interested in knowing more about the African diaspora, American slavery, or the twentieth century African American migration to northern U.S. cities will find insights at the National Museum of African American History and Culture Library. 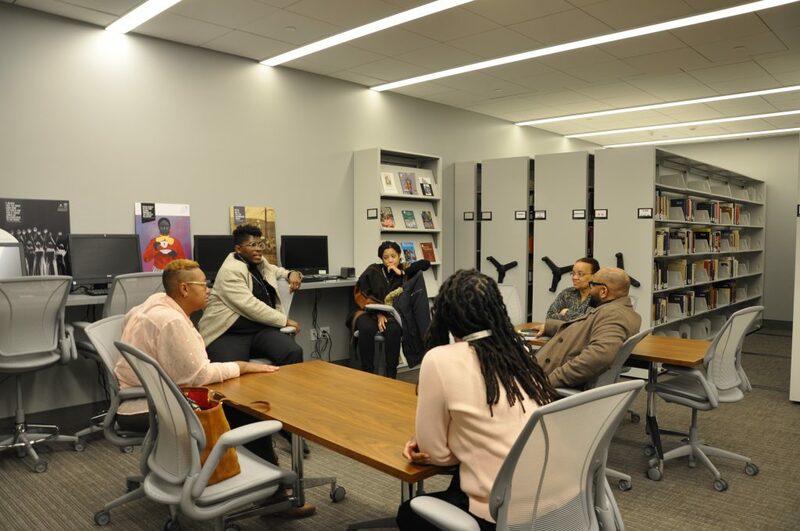 The library is devoted to providing access to resources that support the scholarship of researchers from around the world who study African American history and culture. Located on the second floor of the National Museum of African American History and Culture (pictured above), the library follows the museum’s mandate as “a place where all Americans can learn about the richness and diversity of the African American experience, what it means to their lives, and how it helped us shape this nation.” Collection topics cover the Civil Rights Movement, the American south, clothing and dress, education, military history, literature, music, visual art, politics, religious groups, and segregation. 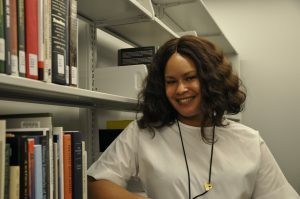 Library staff are available to connect museum visitors with additional information on museum objects and exhibitions, address reference queries, assist with research in the library and archival collections, and direct visitors to additional resources in other Smithsonian collections, or to other institutions. The library features a reading room with computer stations, stack space for 11,000 volumes, electronic and print resources, and a display case for rotating exhibits of library and archival materials. It also developed the museum’s archives program for the past five years, and hired the first archivist. Reading room of the National Museum of African American History and Culture Library. Come visit the Smithsonian Libraries’ newest location, open to the public by appointment, and explore the past, present, and future of the African American experience. Perhaps you will unearth a relevant document for your family history research, or explore information about a newly discovered historical figure from the museum’s exhibitions. In addition to its ongoing research in African American history and culture, the library also tracks recent events and emerging trends, such as contemporary social justice movements, and the culture and politics of the hip-hop community. Libraries have shaped the lives of so many – including mine. They are at the nexus of community and service. Our library at the National Museum of African American History and Culture – under the gifted leadership of Shauna Collier – is a beacon that helps make American history and family history accessible and meaningful. 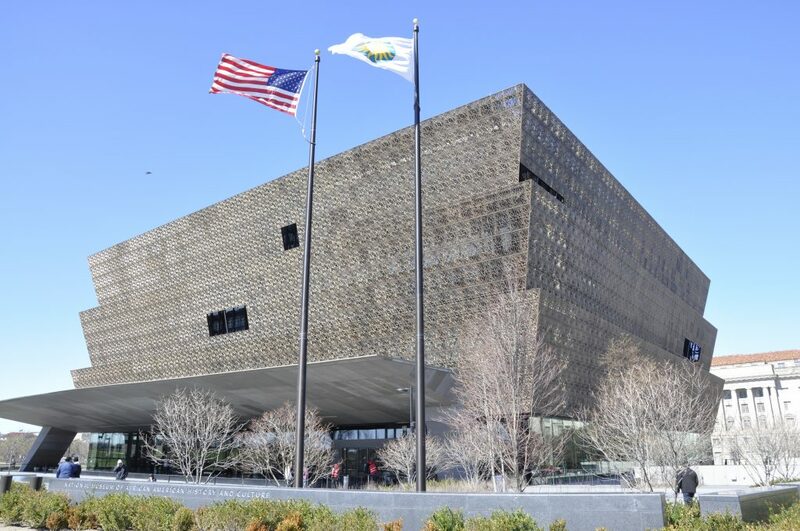 The National Museum of African American History and Culture Library makes the museum complete. What is your role as Head Librarian of the National Museum of African American History and Culture Library? I see my main role as navigating the operations of the library and all that it entails – staff, policy, resources, and more. I am like a quarterback and/or the coach, depending on the day. As the first librarian in this position, and the first person hired for this library, tell me how it all came together, and any opportunities or challenges you faced. The most exciting opportunity for me was creating a new Smithsonian library from the ground up, but this also turned out to be the greatest challenge. For example, on the one hand I was able to apply my ideas and years of experience as a librarian and branch librarian in particular, but on the other hand the devil was in the details as they say! There were lots of decisions, delays, meetings, discussions, revisions, more revisions, and more work than I think any of us imagined. Slowly (and sometimes painfully) it started to come together, and it’s still coming together as we speak, but we are almost there because I can now see the light at the end of the tunnel! I am so proud of what we were able to achieve; it was truly a team effort. Is having both “history” and “culture” in your library’s title significant? Many people think that the museum is strictly a history museum (I often hear visitors and the media sometimes refer to it as the “Black history museum”) and I think that is because of the importance and emphasis on African American history in this country in general. However, the museum’s collections and exhibits also include topics such as art, music, fashion, the culture of historically black colleges and universities, which are all things that speak to African American culture. Since the library is here to support the research of the museum and the institution as whole, we feel that it is important that our name should also reflect the emphasis of our collections, which includes resources in both African American history and culture. In order to support the research of the museum staff and visitors, the library collection is a reflection of the museum’s inaugural exhibitions and ongoing collections, as well as general studies in African Americana. While the collection is largely books, we do collect in various formats, such as media, journals, and electronic. In other words, almost anything in which we can glean information! Also, because our main collecting thrust didn’t really begin until 2014 when I assumed the position as the first librarian, we don’t have much of a retro collection. However, through several generous donations we do have a small amount of 19th century titles that make up the majority of our rare and “restricted-use” collections. What internal and external library services are offered? To internal staff, we offer reference service and research assistance, library orientations and instruction in the use of our resources, and circulation services. In addition, we offer assistance in records management and bibliographic organization to the National Museum of African American History and Culture Museum’s senior staff and curators. I also think of the library itself as a service to internal staff, in terms of providing an inviting space for them to utilize. To external visitors and users we offer reference service, assistance with their genealogy research, and eventually interlibrary loan service through the Smithsonian Libraries’ Interlibrary Loan Services department. Why is genealogy such an important part of your services? It is important for several reasons, but first and foremost, because genealogy and family history are such an important part of African American culture. African American genealogy gained mainstream popularity with the debut of the 1977 television mini-series, Roots, as well as the book of the same title by Alex Haley, but it is still going quite strong, especially with the abundance of genealogy-related shows on television today. Another reason I believe offering services in African American genealogy is important, is because tracing it is often more complex than other ethnic or racial groups in the United States, due to the lack of detailed documentation prior to 1870, and because of the consistent separation of families in slavery. Why is the library an important part of the museum? The depth of African American history and culture is still not as widely known in this country as one would think. There are still many stories that are just now coming to light, and amazingly there are still, “African American firsts.” The library is an important part of the museum, because we provide the resources that help educate our researchers about these type of stories and more – be it a curator researching an upcoming topic for an exhibit, or a museum visitor wanting to know more about an object or a topic in African American history. In my opinion, we are the link in the museum between curiosity and enlightenment. What is one of your favorite or most compelling books in your collection? What museum objects are special to you? One of my favorite books in the collection is The Weary Blues by Langston Hughes because I am a huge Langston Hughes fan, and, because he signed it. I remember the first time I saw it, I could not believe I was looking at his signature and it was a total geek-out moment for me! The other collection I am proud to have is the Ella Fitzgerald collection, which is a small collection of books that were owned by Ella herself. Some of the titles have inscriptions to her from the jazz greats of her time (such as Dizzy Gillespie and Duke Ellington), but the collection also includes a few cookbooks she owned with little notations she must have made –which caused my second major geek-out moment in the library – ha! As for favorite museum objects, I like how important books in African American history and culture are throughout the exhibitions, but I especially love seeing Nat Turner’s bible in the History Galleries. I am also a big art enthusiast, and the fourth floor with the art collections is one of my favorite places in the museum. I love taking a quick break and spending time up there. It always brings me a little joy, so I probably need to do it more often. 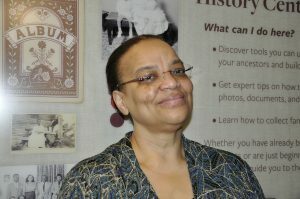 On her role: I provide genealogical and historical reference services; develop and implement genealogy instruction, programs, and presentations; and serve as a genealogy consultant on the National Museum of African American History and Culture’s special projects. 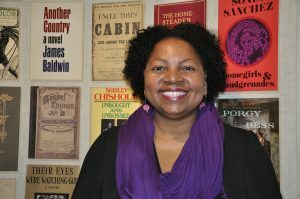 On working at the library: Working here is the realization of a dream I have had for more than two decades which is to provide reference assistance to staff, scholars, and the public on subjects related to African American history, culture, and genealogy. I love research, and enjoy helping other researchers find the information they seek. I also enjoy being amongst colleagues who have a passion for their work. I learn from them, and with them, and enjoy the numerous opportunities for professional and personal development that are available at the Smithsonian. On her favorite book in the library collection: The most personally compelling book to me is a volume edited and published in 1982 by University of Maryland historians Ira Berlin, Joseph P. Reidy, and Leslie S. Rowland titled The Black Military Experience. That volume changed the trajectory of my life, and is one of the inspirations that led to my becoming a professional genealogist. I discovered a transcribed letter in the volume which was written by Ann Sumner, a Virginia ex-slave who I thought was an ancestor. That discovery inspired me to develop expertise in using federal records for African American genealogical research, which eventually brought me to my current position. On the most meaningful museum object to her: One of my favorite objects in the museum is a painting by expressionist artist Herbert Gentry. My mother and I met him at his New York studio where we heard stories about the places he and other famous African Americans lived and worked in Paris during the years following the end of World War II. We kept in touch with him until his death in 2003. His painting brings back memories of his stories and of my trip to Paris, tracing the footsteps of African American expats. On her role: I manage the circulation of our collection and sort the many donations that we receive according to our library’s needs. On working at the library: I do not think I can string together the words that would describe why I love working here, but it is a miraculous privilege to be a part of history. Every day I get to see and help the people who have helped make this museum a reality. 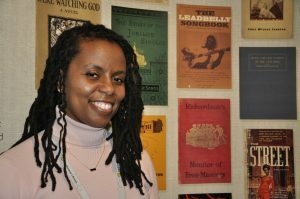 On her role: I field research questions from museum staff and the general public on subjects related to African American history and culture. I also work on various projects and tasks related to maintaining the library collection and supporting the Libraries. On working at the library: I enjoy learning new things from the museum staff and from the interesting books that we acquire. African American history is multifaceted, and I can never learn enough about it. On her favorite book in the library collection: I am a fan of any book that humanizes a regular person and gives keen insight into what life was like in a different time or place. What was it like to be a new mom during slavery? What was it like to be a wealthy African American woman at the turn of the 20th century? What can I learn from a person of color who left everything to move out west? On the most meaningful museum object to her: One of many objects that captures my attention is “Ashley’s Sack.” The object (a cotton sack featuring an embroidered text recounting the slave sale of a nine-year-old girl named Ashley and the gift of the sack by her mother) is a reminder to me that taking the time to create something seemingly small can have a large impact and mean so much to so many people. A legacy can be powerful no matter the size. Previous Post Join us for a Women in Natural History Wikipedia Editing Workshop on 13 March! Great article. I had an opportunity to meet Shauna Collier on our first visit to the museum. She treated us royally and displayed an in-depth knowing of the collection and various displays. The biggest takeaway from our meeting was the infectious delight she displayed about the workings of the museum.